You're not lazy, you're effortless. 2. Whip up a wizard's robe for your Harry Potter-obsessed little one with a T-shirt in just 15 minutes. This costume only cost $4.98! 7. For a little added Halloween festivity, thread spider rings onto a little girl's pigtails. Everyone wants to be a Minion. See how she made this here. 19. If you've got a big gang to dress, make everyone wear black and glue white dots to their outfits. You'll start a chain reaction. Glue some straws on for a prickly cactus. Arrange arms accordingly. 24. If you've already got a glamorous all-black wardrobe, become a glam skeleton with just a little face paint. Get the makeup tutorial here. Painted wire and a printed Photoshop icon! 27. Round touch lights from any hardware store and paper antlers and you are transformed into a "deer in headlights." No one said you had to put the touch lights on your chest, though. 28. Share an XXL T-shirt with someone you won't mind being tethered to for the whole night. 29. Are you a parent who posts way too many photos of your baby on Facebook? At least on Halloween you can make fun of yourself a bit. All you need is black posterboard. 30. Literally tie up your button-up shirt, add a bandana, and pair with the high-waisted jeans you (probably) already own. You can literally go from day to night with this outfit. 31. The bandana (paired with very pretty '50s makeup) can also turn you into Lucille Ball. 32. Got a lip palette, lip brush, and black eyeliner? 33. Turn yourself into a mermaid by applying makeup over a fishnet stocking. 34. Need a costume that requires custom colored boots or shoes? (AKA any superhero costume.) Use duct tape! 35. Or colored legs for that matter? Don't spend your precious dollars on colored tights! You can dye pantyhose with Kool-Aid. 36. "Crazy cat lady" is the coziest and warmest of all costumes. 37. Be a cupcake cutie with simple supplies from the craft store. 38. A cardboard box and Tupperware make a great parent's costume. 39. Don't want to bother with a real costume? Make an easy cobweb tiara with wire and a headband. 40. 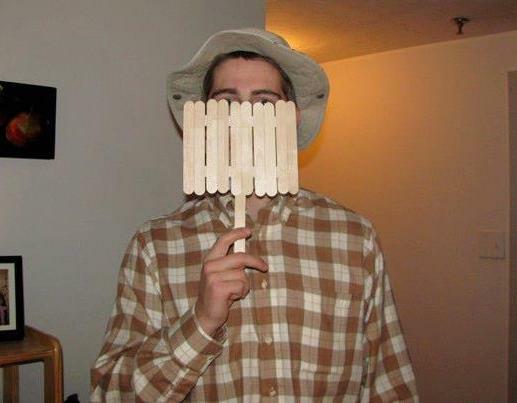 Popsicle sticks and a fisherman's hat = instant Wilson. 41. A white polo shirt and a remote control = Funny Games. For your own sake, you'd better be even half as hot as Michael Pitt. They sell all sorts of colored floral wire at the dollar store. Get the directions here. 43. Live in a cold climate? Transform an old pair of gloves into monster claws. 44. Make your own Wyldstyle costume using colored tape on a black hoodie and hair chalk. 45. You can (and should) wear this T-shirt all year round. 46. This costume is so easy, a child could make it. But you should probably supervise. Directions here. 47. Use fake foliage to sprout a chia head. You can double as Felicity after she cut her hair. 48. Draw on white stockings to channel Sally from Nightmare Before Christmas. 49. This spectacular cape is completely no-sew. 50. As is this colorful strawberry costume. 51. And finally...for groups of friends who still won't stop quoting Mean Girls.